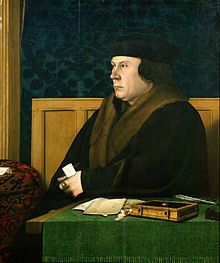 Thomas Cromwell, 1st Earl of Essex (c. 1485 – July 28, 1540) was an English statesman, King Henry VIII's chief minister 1532–1540. I amongist other have indured a Parlyament which contenewid by the space of xvij hole wekes, wher we communyd of warre, pease, stryffe, contencyon, debatt, murmure, grudge, riches, poverte, penwrye, trowth, falshode, justyce, equyte, discayte, oppressyon, magnanymyte, actyvyte, force, attempraunce, treason, murder, felonye, consyle[ation], and also how a commune welth myght be edeffyed and contenewed within our realme. Howbeyt in conclusion we have done as our predecessors have bene wont to doo, that ys to say as well as we myght, and lefte wher we began. Who seeth not that he that is an evil counsellor to a prince is an evil counsellor to a realm? If it be sin to be an evil counsellor to one man, wat abomination, what devilish and horrible sin is it to be a flatterer or an evil councillor to a prince? Where by divers sundry old authentic histories and chronicles, it is manifestly declared and expressed that this realm of England is an Empire, and so hath been accepted in the world, governed by one Supreme Head and King having the dignity and royal estate of the imperial Crown of the same, unto whom a body politic compact of all sorts and degrees of people divided in terms and by names of Spirituality and Temporalty, be bounden and owe to bear next to God a natural and humble obedience. Cromwell's preamble to the Act in Restraint of Appeals, March 1533. My lord, you had showed yourself of much more patience—I wll not say of much more prudency—if ye had contented yourself with their lawful appeal and my lawful injunctions and rather have sought fully to instruct me in the matter than thus to desire to conquer me by shrewd words, to vanquish me by sharp threaps [assertions] of Scripture which, as I know to be true, so I trust to God—as great clerk as ye be—ye allege them out of their place. The king's majesty desires nothing more than concord...; he knows there are those who would stir up strife, and that in many places in his field tares have sprongen to harm the wheat. The forwardness and carnal lust of some, the inveterate corruption and superstitious tenacity of opinion of others, excite disputation and quarrels most horrible to good Christian men; one side calls the other papists, and the other again calls them heretics, both naughty and not to be borne; and that the less so because they miserably abuse the Holy Word of God and the Scriptures which the same most noble prince of his gentleness and for the salvation and consolation of his people has permitted them to read in the vulgar tongue. They twist God's sacred gift, now into heresy and now into superstition. [The king] favours nor one side nor the other but, as becometh a Christian prince, profess the true Christian faith [therefore the king desires the] true doctrine and rule of the Gospel shall be published clear and established [and] the pious observation of ceremonies shall be distinguished from the impious, their use taught and their abuse abolished. I have meddled in so many matters under your Highness that I am not able to answer them all...but hard it is for me or any other meddling as I have done to live under your grace and your laws but we must daily offend. [I have had many a talk with Cromwell] of god, of nature & of other polytyke & wordly thyngys [from which he has] geddryd more frute of truth then I have downe of any other man lyvyng syth I cam here to my cuntrey. Henry VIII to the French ambassador, May 1538. Many lamented but more rejoiced, and specially such as either had been religious men, or favoured religious persons; for they banqueted and triumphed together that night, many wishing that that day had been seven year before; and some fearing lest he should escape, although he were imprisoned, could not be merry. Others who knew nothing but truth by him both lamented him and heartily prayed for him. But this is true that of certain of the clergy he was detestably hated, & specially of such as had borne swynge, and by his means was put from it; for in dead he was a man that in all his doings seemed not to favour any kind of Popery, nor could not abide the snoffyng pride of some prelates, which undoubtedly, whatsoever else was the cause of his death, did shorten his life and procured the end that he was brought unto. And shall I name one who hath been in our age, and wish him now to live to cure so great a canker? Would God England had a Cromwell: I will say no more. Thomas Wilson, Discourse on Usury (1571), p. 182. It is not unreasonable to argue that if Henry had been willing to carry out Cromwell's advice about using and husbanding his resources, and if he had not destroyed Cromwell in act of supreme folly, then by the time of Henry's death the English monarchy might have been strong enough to withstand the threats to its supremacy which the future was to bring. If Cromwell had succeeded in making Henry all-powerful, then the future history of England could have approached more closely to that of France under the Bourbons, and the English parliament suffered the same fate as the Estates General. This page was last edited on 12 April 2019, at 19:30.